New Majors and Programs Debut Fall 2017 From dance to data science, new CAS programs offer something for everyone. This fall, AU students can take advantage of a diverse group of new undergrad and graduate majors, minors, and tracks within the College of Arts and Sciences. The Critical Race, Gender and Culture Collaborative has launched a new major in African-American and African Diaspora Studies (AADS). It will include 36 credits and require an internship and a senior capstone. AADS is an interdisciplinary major that examines African American history culture in the continental United States in the context of contemporary and historical African cultures, theories of racial ideology and race politics, and the distinctive artistic, literary and cultural practices of African people worldwide. The Department of Performing Arts has launched a new BA in Dance. The major will require 43 credits focusing on embodied knowledge (dance technique, movement forms, somatics), critical inquiry (kinesiology, history, technology, business), advanced concentrations (student driven, faculty guided), and creative practice (creative tools, seminars, capstone project). "The BA in Dance is for the innovative AU student who wants to make connection between disciplines and forms, who wants to push themselves physically, creatively, and academically, who wants to be a forward thinker and creative doer in a moving world," says Britta J. Peterson, the director of the Dance Program. The new Masters of Sociology Research and Practice is a 30-credit hour degree that can be completed full-time or part-time, including evening courses and a capstone project. Students will immerse themselves in research focusing on the social determinants of health, particularly related to social inequities of race/ethnicity, social class, gender and sexuality, and in connection to other sociological subfields such as urban development, migration, education, and social movements. Students will be oriented to methods of doing research on health and society and engage in a research project focused on issues in Washington, DC. The program will build students' data analysis capacity-both qualitative and quantitative-and hone their ability to present research results to various audiences. The expansion of computational tools and methods has resulted in an acute need for deep mathematical insight within both government and industry. With its strong basis in mathematical and statistical theory, the Information and Security track has been developed to fill this need. 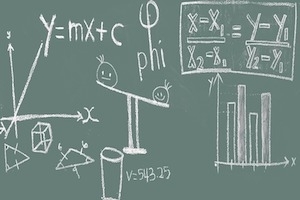 The 30-credit track, within the MA mathematics degree, combines courses in theoretical and applied mathematics, data science, and information technology to provide students with a unique education in theoretical understanding, coupled with practical experience. No other program in the DC area encapsulates all three areas of study, making its graduates desirable to both government and industry employers. Students get the opportunity to take courses in cyber intelligence, national security, and counterterrorism, and can also take advantage of internships to gain real-world experience while getting graduate credit. The world runs on information. We are surrounded by huge amounts of data, and businesses, governments, and NGOs must be able to analyze this data effectively. The new Data Science track, Data Science minor, and Graduate Certificate in Data Science were developed to fit this need. The 53-credit hour data science track gives students the ability to combine statistics, computer science, and mathematics to analyze large amounts of data. The learning outcomes for students will include the ability to visualize data using graphical tools, and to develop statistical machine learning algorithms for supervised and unsupervised learning environments. The new 20-credit hour minor in data science was designed to provide students with a strong technical component to address current industry needs to analyze large amounts of data. Full-time students and part-time students could complete the minor in two years. During the first year, they can take two courses in basic and intermediate statistics, along with calculus. In the second year, they may take upper division courses. The Graduate Certificate in Data Science is a 12-credit program that gives students the core technical proficiencies to visualize and analyze data, building on their current knowledge to help them become data scientists. The program provides a standalone data science certification, but credits from the program can also be applied to many graduate degrees offering a data science track. Courses are offered in the evenings to accommodate working professionals. Applications include targeted marketing, genetic research, autonomous driving, and strategic business planning. Building a better future starts in the classroom. The new online master's degree programs from American University's School of Education are designed to prepare students to teach the next generation of difference makers. American University's online MAT is CAEP-recognized and designed for individuals who have a bachelor's degree and are interested in obtaining a teaching license in elementary or secondary education (English and social studies). No previous training in education is necessary, and students can obtain more than 600 hours of classroom experience in 20 months. American University's online master of arts in special education prepares individuals for meaningful careers in special education, helping them to become driven educators who fully comprehend how to support those with learning challenges. No previous training in education is necessary, and students can complete student teaching in their local area in 20 months. With an online master's degree in education policy and leadership from AU, those with a fervent desire to change the course of American education will have the tools to do so. The degree focuses primarily on policy, leadership, law, economics, and research, allowing graduates to cultivate the perspective and skills necessary to shape education policy and change schools. Student learn from current and former DC-based policy makers, conduct consultancy projects in educational organizations, and can earn a degree in 20 months.